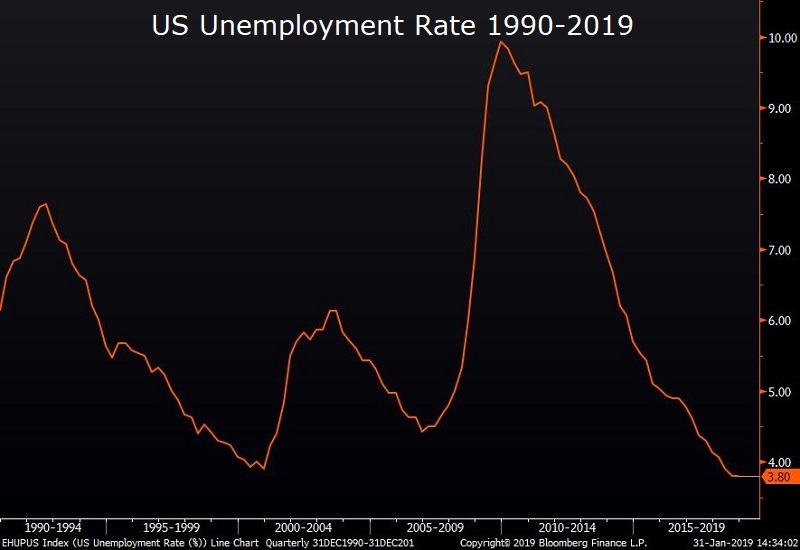 Rates fall as market digests weak jobless claims data and “Powell Put.” Treasury yields and swap rates continued yesterday’s momentum- falling 5-8 basis points across the curve. The 10 year treasury yield trading as low as 2.619%. 10 year swap rates are now at 2.657%, more than 7 basis points below 3 month Libor. Fed funds futures are now pricing in merely a 3.7% chance of a hike by the end of the year, and nearly a 25% chance of a rate cut. Much of the move can be attributed to a surprisingly accommodative Fed and speculation that there is a “Powell Put” in at the Fed. Indeed, the Fed has now opened itself up to criticism that it acquiesced to market pressure after a full 180 reversal from the tightening bias expressed at the December FOMC meeting. Non-farm payrolls figure to be released tomorrow. Consensus estimates call for non-farm payrolls to grow by 165,000---a sharp deceleration from December’s blockbuster 312,000 gain. The unemployment rate is expected to remain steady at 3.9%. 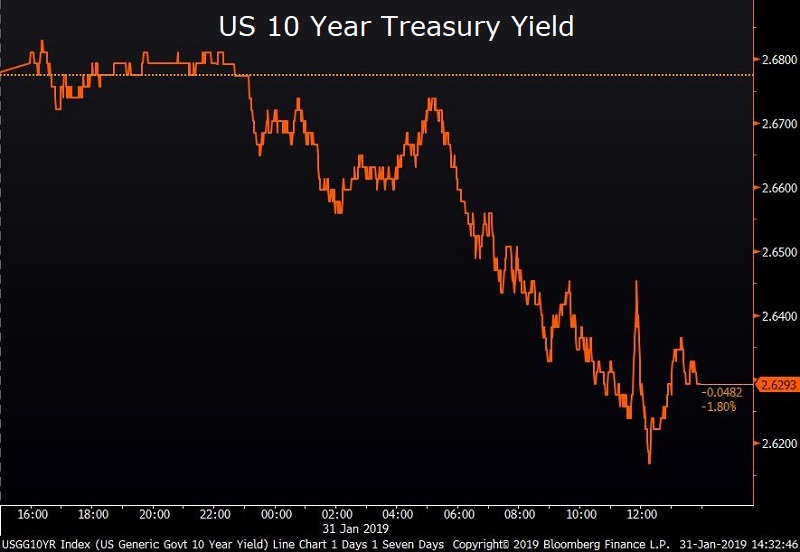 Given the dramatic decline in Treasury yields during the past few days, rates could rebound if the payroll report comes out stronger than anticipated. Stocks enjoy record January gain. 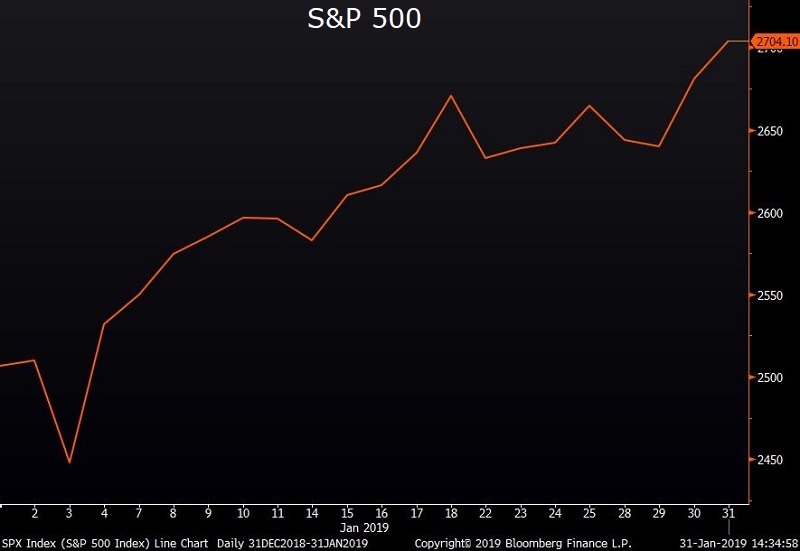 The S&P 500 ended the best month its had in three years on a positive note- closing up .86% after General Electric and Facebook both reported strong quarterly results. For the time being, equities have shrugged off concerns around the US-China trade dispute and slowing global growth, buoyed by generally better-than-expected earnings reports. China and US Trade Talks Progress. President Trump spoke today from the Oval Office as Chinese officials stood by, both sides saying they hoped for a quick resolution to the trade dispute. Chinese negotiators are proposing a late February meeting between President Xi Jinping and President Trump.